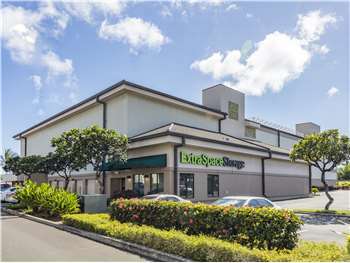 Located on Kalanianaole Hwy, Extra Space Storage serves Honolulu residents near Hawaii Kai, Kuliouou-Kalani Iki, and more. Locals will recognize our facility near Hawaii Kai Towne Center and Maunalua Bay Beach Park. Extra Space Storage on Kalanianaole Hwy offers a wide range of storage units sizes, climate-controlled storage, drive-up access, and exceptional security! We're your storage solution in Honolulu! I had a great experience with the Asst Store Mgr Salina. She was helpful in me choosing the right unit, provided me with plenty of options, nd was very patient when I asked way too many questions. I'd recommend the facility just based on her customer service alone. Drive south on Hahaione St. Turn right onto Hawaii Kai Dr. Turn left onto HI-72. Turn left onto Keahole St. Turn right at Tesoro then take the first left. Our facility will be ahead on the right. Drive northeast on Portlock Rd. Turn right onto Lunalilo Home Rd. Pass Koko Head Elementary School and turn left onto HI-72. Turn right onto Keahole St. Turn right at Tesoro then take the first left. Our facility will be ahead on the right. Drive northwest on Wailua St. Turn left onto Hawaii Kai Dr. Continue straight onto Keahole St. Turn left before Tesoro then take the first left. Our facility will be ahead on the right. Drive east on HI-72. Turn left onto Keahole St. Turn right at Tesoro then take the first left. Our facility will be ahead on the right.